I've spent my entire life feeling different, odd, excluded, forgotten and strange. When I was a kid, I wasn't smart enough to even be considered a nerd. I had one friend at a time until that friend moved away. I spent a lot of time being ignored more than ridiculed. I ways wanted to "fit in" but I just didn't, so I retreated into the thing I knew more about than anything, art. 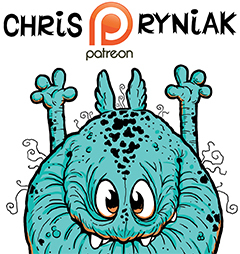 More specifically, drawing monsters and strange creatures. Years went by, life had its ups and downs, but art was still what held me together, through illness, injury, heartbreak and solitude. Now here I am, a full- grown adult with understanding and insight, but still full of those feelings that plagued me as a kid. They form you, shape you and scar you for life. The one thing I wish I would have known back then, is that no matter how it may have felt, ultimately, I was better for it. Better off not being part of the crowd, better off learning who I was on my own, better being a weirdo. Because without that, I would not be who I am today, and would never have accomplished so much as an artist. I asked my daughter, my AWESOME 9-year-old daughter, who was watching My Little Pony, if she liked that show. She said " Is it OK that I like that show?" She was concerned that liking a girly show for little kids would tarnish her otherwise tough-tomboy persona. I had to tell her what I want to tell EVERYONE: It's ok to like everything that you want to like ! It's ok to be a little of everything. As a matter of fact, it's AWESOME to be that way. The second you identify with one specific thing, you exclude other things and people that you could otherwise be learning about or enjoying. Be fiercely who you are, but be humble, be understanding. There WILL be people in your life who will make things hard, there will be bullies, but they don't control you, don't let them make you feel like being YOU is wrong, because it's not. This is all leading to what Sparkle Pony Magic represents, pride in yourself. This character, without it's luxurious mane, innocent eyes or soft colors is otherwise just a grotesque slug monster. But Sparkle Pony magic holds it's head up high and gallops through life proud to be what it is, a magnificently weird and complicated creature, just like you and me. Such a good post, Chris! Ahh, I love this! You made my day, not only with the awesomely cute sparkle pony, but also with your post. I (was/am) a kindred spirit, only mine was books. So thanks! How Awesome! Our girls will be so strong, gaining from our wisdom and past experiences. I have 2 girls, and they proudly call themselves Geeks. They are my world. So confident, at times, and so fragile. But when they ask questions, like your daughter did about My Little Pony, we are able to talk it through with them. How amazing is that! love this! raising kids is such an awesome way to teach what we maybe wish we had learned earlier on in life. 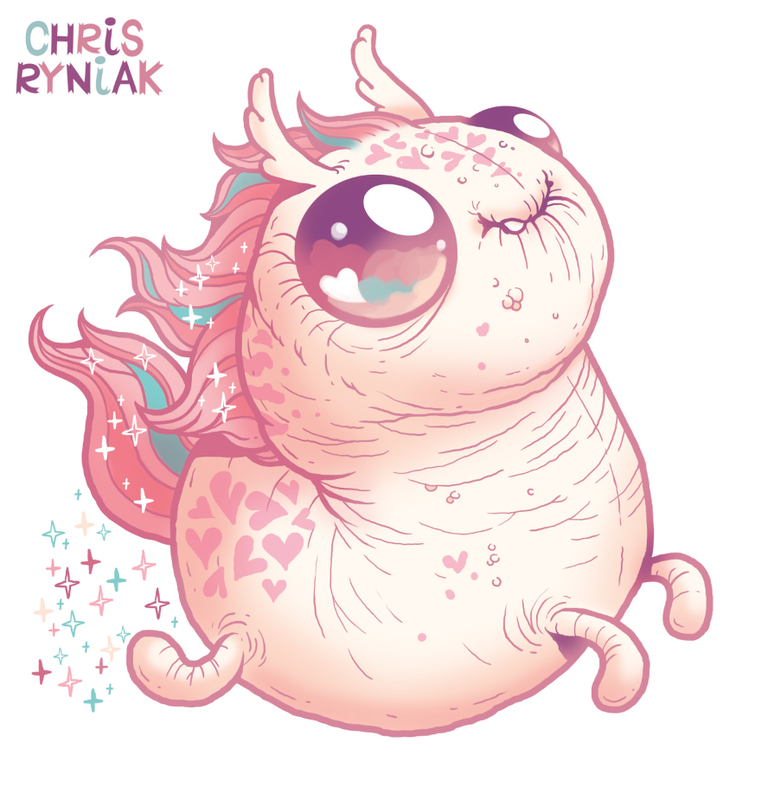 also, just noticed you made this fabulous creature into stickers...please tell me you're bringing some for us to carry at stranger factory! Everyone can benefit from some Sparkle Pony Magic in their lives, young and old!! Thank you for the encouraging and inspirational post! Can be made it into earrings? Chris... you are a wonderful mirror of truth and I thank you for being you! There's not enough of people being their true selves in this world! I utterly and completely adore your work and cannot wait to own one of your original sculptures! As a fellow artist I identify with all you wrote and completely and whole heartedly agree. Only once we be who we really are can we love that soul..so our authentic true life can follow. Thanks for following your truth and being a beacon for others to do the same. When will your store be stocked again? I would love to get a couple of your figurines but cant find any. Thanks. If you are looking to hire any new as well as well experienced Princess Birthday Party then make sure you look for the best of service providers. Bouncy Castle Rentals Toronto will be done princess party toronto with some of the best princess party toronto as well as the effective service providers who are well experienced and known to offer quality solutions for any kind of event or occasion. I am looking for good Seattle Venues for our wedding. Planning to book venue soon so can do other arrangements at my pace. However, having a hard time in finding venue within our budget. Everything seems to be expensive these days. With time there are many photo booth rental toronto party organizers coming up that are all playing an important role in making the event special in all ways. There are different events as well as other functions organized by them which is ideal in all ways. There are facilities as well as toronto magician arrangements available for every individual or guest. Are you interested about that you may visit their website for further details.